The red fox has become the most widely spread member of the order Carnivora, not because of any of its specialist adaptations, but rather the lack of these adaptations (Sillero-Zubiri et al. 2004). Paradoxically, the lack of specialist adaptations has enabled its wide success. Many adaptations found in Vulpes vulpes reflect the variety of prey as well as habitats which the red fox can comply with (see Interactions and Habitat). The red fox is a medium-sized canid and the largest of the genus Vulpes. 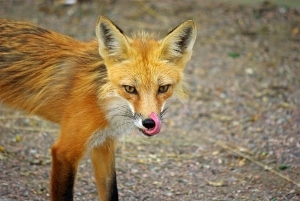 Red foxes have slender and pointed muzzles with white on their upper lip. They have large, pointed and black backed ears. Their pelage (fur) is generally reddish-brown but has many varieties including red, silver, and cross morphs. Cross foxes have reddish brown pelage with a back stripe down the back and a second across the shoulders. 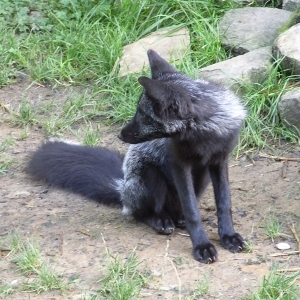 Silver foxes range from strong silver to nearly completely black as in the example to the right. Females may have pink-tingled underfur during the breeding season. White markings may be found on the throat and chest. Red foxes have long and slender legs with the lower proportion of the leg being black; possibly splashed with white. Their tails are long, bushy and thick, sometimes with a white tip. The eyes of mature animals are yellow. The fox, like other canids have molar structures emphasizes crushing. Red foxes have tail glands which lie within the dermis and subcutaneous tissue above the root of the tail (Animal Diversity Web 2013). Body weight ranges from 3-14 kg (6.6-30.9 lbs). Body mass is positively related to latitude and varies greatly by region. Red foxes display high sexual dimorphism (distinct size difference between sexes). Where the males are bigger (Sillero-Zubiri et al. 2004). Some of the most critical adaptations to the red fox’s physiology involve thermoregulation. The same dense, but short fur which was so popular to fur traders is an important surface for thermoregulation. Fur covers one-third of the body’s surface area, particularly the face, dorsal part of head, nose, ears, lower legs and paws. The nose is used for evaporative cooling and most likely forms part of a brain cooling mechanism as described in domestic dogs (Klir and Health 1992). These adaptations allow the red fox to compete to a certain extent with the artic fox in cold environments and simultaneously have the ability to survive in a much warmer habitat. Adaptations involving prey detection and capture require fine-tuned senses and swift reflexes. Keeping in mind that the red fox is typically active at dusk (crepuscular) or at night (nocturnal) visual detection can be limited. 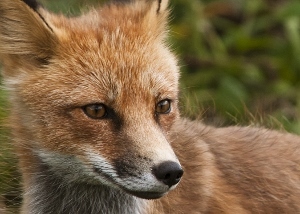 To detect its prey, the red fox can use a variety of senses, one such being hearing. Red foxes can locate sounds to within one degree at 700-3,000 Hz, and slightly less at higher frequencies. This sense enables initial detection to begin prior to visual detection. A red fox’s eyes have evolved very similarly to cats. Their retinas are dominated by rods which are photoreceptor cells like cones except they do not see color or produce as sharp of images, however they function much better in low-light (Liska 2013). Following detection is capture. 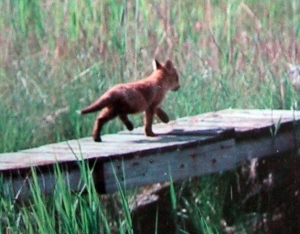 The red fox has adapted to pounce on their prey with great precision, by manipulating take-off angle; adjustments can be made to the length of the jump and the force of landing. Their hind legs are relatively longer than other canids which increases propulsive force and consequently makes them more effective predators (Sillero-Zubiri et al. 2004). Following capture, a series of quick bites follow to dispatch prey which is uncharacteristic of wolves or dogs who shake their prey violently. 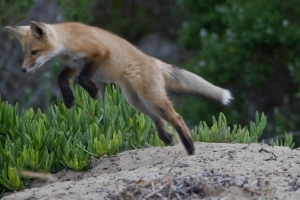 To watch a red fox pouncing and successfully capturing a prey watch this video. In the case of hunting rabbits or other prey where the capture of prey involves pursuit, the red fox is prepared with great endurance allowing it to gallop for several kilometers when hunting and while being pursued. They are able to run at speeds up to 48 km/hr (30 mph), jump fences two meters high (6.5 feet) and swim well (Haltenorth and Roth 1968). The physiology of their senses and their physical size and agility culminate to produce a well suited predator of small rodents and other small prey. Not all adaptations come in the form of physical adaptation; red foxes have developed a behavioral adaptation to the unreliable availability of prey (MacDonald et al. 1994). Caching is a method red foxes use to store food for later. During this process, a shallow hole 5-10 cm deep is dug, a food item (relatively small in size) is deposited, and then the hole is covered and camouflaged (Liska 2013). This behavioral trait is not unique to red foxes, as it can be found in many candids. Scientists have used this behavior to their advantage by planting vaccine-laden baits during rabies-control operations (Macdonald et al. 1994). Advance on to Reproduction, the force that drives most of evolution, reproductive success! Now that you know what generalist adaptation is, return to the Homepage to explore more! Visit MultipleOrganisms.net to see a huge variety of adaptations!